Every year, we observe extreme weather phenomena and changes in our climate. The wasteful use of energy and resources and the increasing transportation of products around the world affect the environment and in order to minimize the harm, further action must be taken. The European Commission, working towards the protection of the environment, has published several strategies examining the factors responsible for this situation and providing several solutions. In the thesis, these strategies are analyzed. The strategies concern mainly the air pollution and the protection of the environment but examine also the sustainable use of the marine environment, the protection of the fauna and flora and the importance of safety in the European seas. One of these papers, which pays special attention to the marine environment, is the Integrated Maritime Policy or else called, the Blue Paper. The paper recognizes the importance of using the seas and the oceans in a sustainable manner and promotes the cooperation between the European Countries. 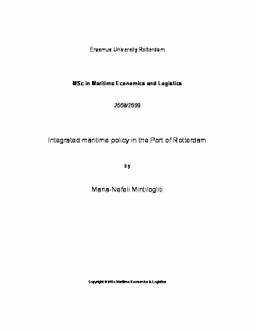 In the dissertation, the effects of the Integrated Maritime Policy to the Port of Rotterdam are examined. In the thesis, a brief history, important figures of the Port of Rotterdam and information on the Maasvlakte 2 project are provided at first. Additionally, the efforts of the Port Authority to create a port that is not only successful but also accessible and sustainable are analyzed. The current situation in the European Union and the Netherlands, as far as the air pollution is concerned, is examined and measures and actions taken by the European Countries in order to achieve a decrease in the emissions of greenhouse gases are also provided. Moreover, measures taken by the City of Rotterdam and the Port Authority to decrease the air pollution are examined. In the last part of the thesis, the effects of the Integrated Maritime Policy to the Port of Rotterdam are analyzed. These effects are mainly projects, in a testing phase or projects already used in other ports, which can lead to a decrease of the greenhouse gases’ emissions and can be useful tools to the Port Authority to handle effectively the increasing amount of cargo paying also attention to the environment. The conclusion of the thesis is that the Policy has overall a positive effect to the Port of Rotterdam. On the other hand, there are still difficulties which must be considered and problems to be resolved.